I haven't been there myself yet, but my buddy Eugene has frequented the recently renovated Champions Bar a number of times to catch a few sports games. I have to admit, I'm not much of a sports watcher. It just takes more hours than I usually have at any given point. But this could be fun place to hang out with friends. Marriott International is launch[ed] the re-invention of its popular Champions restaurant brand at the Boston Marriott Copley Place this [past] summer. 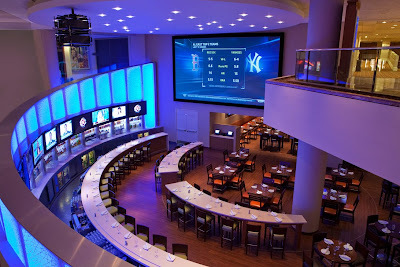 The sleek, modern restaurant features the largest HD projection screen in the area (at 12 x 24 feet), over 40 flat panel televisions and a technologically advanced sound system for a superior viewing experience. 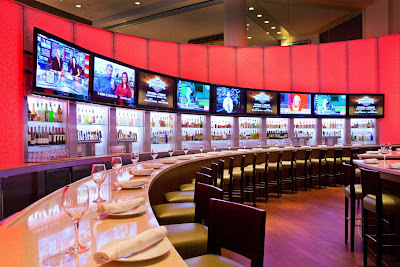 Together with an all-American grill menu, 36 beers on tap, and numerous cocktail offerings, Champions promises to become one of Boston’s newest entertainment and dining destinations. I will admit, the last time I was in NYC visiting friends, we went to a sports bar to watch football and the ability to watch every single game simultaneously was pretty awesome. My poor tv doesn't even have picture in picture so I'm relegated to one game at a time. From those pics above, I think that maybe I should start hitting up Champions more often than not to watch ye old football. 0 Response to "Renovated Champions Bar Looks Kinda Awesome"